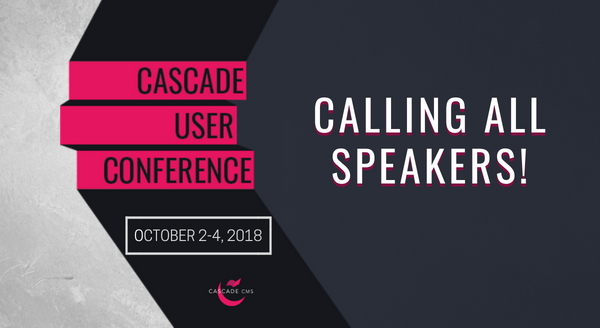 The deadline to submit a speaker proposal for the 2018 Cascade User Conference is less than two weeks away! Only a limited number of slots remain, so be sure to submit your ideas on or before Friday, August 3. Our goal is to have session tracks that cover a wide-range of topics for both Cascade CMS beginners and highly-technical users, as well as discussions about digital strategy and content marketing. Your knowledge, expertise, and first-hand experiences will benefit your peers tremendously. And you get a free pass to the conference, a $1,050 value! Here are some of the topics we’re particularly interested in, but please feel free to submit other ideas as well. Please fill out the form below to submit your proposal. The deadline for entries is August 3. We’ll notify you by August 10 if your proposal has been accepted. Please note that you may submit more than one topic. We look forward to reviewing your ideas! To learn more about the conference or register now, please visit conference.hannonhill.com.